"Birth: Josiah Winslow was born on February 11, 1605/6, in Droitwich,Worcestershire. Death: He was buried on December 1, 1674, in Marshfield. 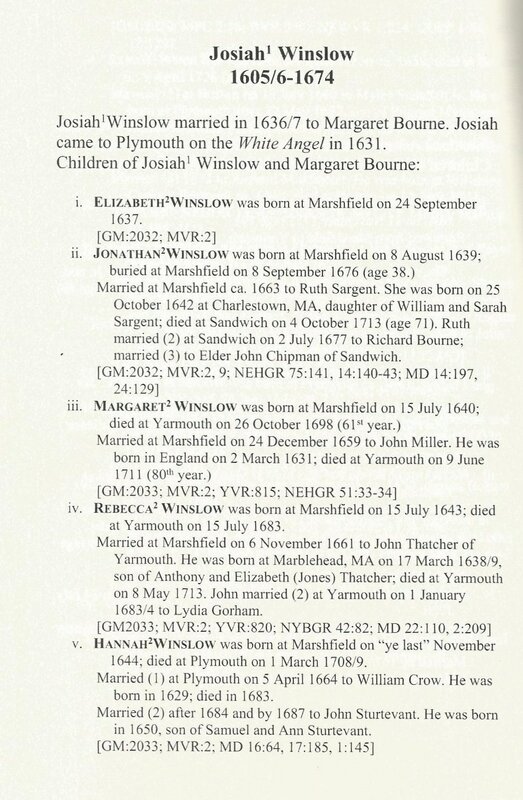 Life in England: Josiah Winslow was the youngest child of Edward and Magdalen (Oliver/Ollyver) Winslow of Droitwich, Worcestershire. Life in New England: Josiah Winslow arrived in Plymouth in 1631, sent by the colony’s investors to keep accounts. The investors accepted him initially for the sake of his brother, Edward Winslow, Mayflower passenger and Assistant Governor. Unfortunately, Josiah proved to be incompetent. William Bradford wrote that he “did wholly fail them and could never give them any account; but trusting to his memory and loose papers, let things run to such confusion that neither he nor any with him could bring things to rights.” He was admitted a freeman of Plymouth on January 1, 1633/4, but moved to Marshfield by 1643. Josiah’s confusion over financial matters apparently held to the last, and the court made void his conditional bequest of house and land to his son Jonathan, as he had already given the property to him at his marriage. Josiah was one of five brothers (Edward, John, Gilbert, Kenelm, and Josiah) who came to New England. • Elizabeth was born on September 24,1637,in Marshfield. She was apparently accidentally shot and killed by her eight-year old brother, Jonathan, in 1646. • Jonathan was born on August 8, 1639, in Marshfield. He married Ruth Sargent by 1664 and had six children. • Margaret was born on July 15 or 16, 1640, in Marshfield. She married John Miller on December 24, 1659, in Marshfield and had eight children. • Rebecca was born on July 15, 1643, in Marshfield. She married John Thatcher by 1665 and had eight children. • Hannah was born on November 30, 1644, in Marshfield. She married (1) William Crow on April 4, 1664, in Plymouth She married (2) John Sturtevant by 1687 and had two children. ​• Mary was born about 1646. She married John Tracy on June 10, 1670, in Marshfield and had one daughter." For Further Information: Robert C. Anderson. The Great Migration Begins. Boston: New England Historic Genealogical Society, 1995. Robert C. Anderson. The Pilgrim Migration. Boston: New England Historic Genealogical Society, 2004.Bradford, William. Of Plymouth Plantation, 1620–1647. Edited by Samuel Eliot Morison. New York:Alfred A. Knopf, 1952. Edgar Francis Waterman and Donald Lines Jacobus. The Waterman Family,Volume I, Descendants of Robert Waterman. New Haven, Connecticut: Edgar F.Waterman, 1939.